What is it for? What can it do? Where can I download it? There are currently two modes within the app, Manual Mode and Balance Mode (Beta). Please note that Balance Mode disappears if you add Temp Sensors to your app, since the two were not designed to work with one another. 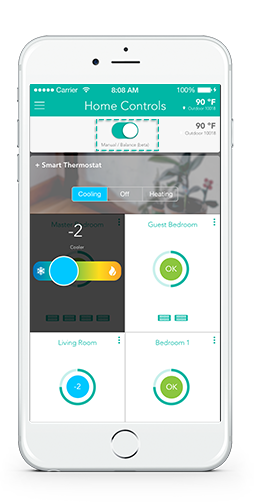 Temp Sensors will give you more precise, temperature-controlled automation for each room. Manual Mode is the easiest way to fine-tune how open or closed your Smart Vents are. Press down on the circle in the middle of each room tile to activate the manual adjustment. 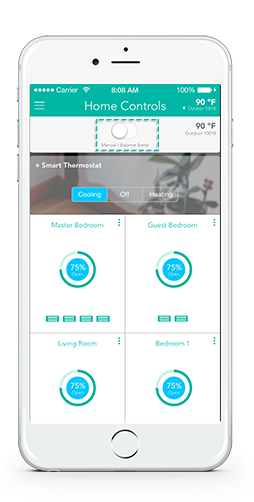 Move the slider left or right to change the openness percentage each Smart Vent in the room should be. To enable Manual Mode, move the slider at the top of the screen to the left. Balance Mode takes manual control to the next level. Instead of controlling each room’s level, our Keen Balancing™ algorithms enable control over relative room temperature. We refer to Balance Mode as (Beta) because we are only scratching the surface of how useful this mode can be. While Balance Mode is enabled, press down on the circles with ‘OK’ at the center to offset the temperature of a room. Tell your Smart Vent System whether your home is being heated or cooled, or connect your Nest Thermostat to share it automatically. Based on this information, your Smart Vents will automatically know whether to open or close to offset the temperature of the room and make it cooler or warmer. You can find your account settings by tapping the three horizontal lines in the upper left and then tap on your email address/picture(silhouette). From the Edit Account page, you can change your temperature scale from Fahrenheit to Celsius, change your zip code / postal code, change your account's email address or password, or update your time zone. The Keen Home iOS app is available in the Apple App Store here and can be easily found if you search "Keen Home." Our Android app can be found in the Google Play store here. Please note: to use either of our apps, you'll need a Keen Home Smart Bridge.